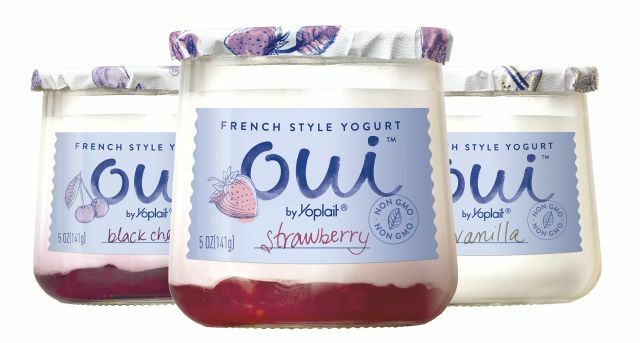 Yoplait looks to expand the yogurt category with the debut of new Oui by Yoplait, which they're billing as "French-style" yogurt. Unlike strained/Greek yogurt, a search for French-style yogurt won't yield much in the way of unique characteristics as it appears to be a made-up category. Still, it's a little ironic that the brand that first came to the US (way back in 1981) from France as a French yogurt has now chosen to market a new line of French-style yogurt. According to the brand, Yoplait's French-style yogurt features non-GMO ingredients such as whole milk, cane sugar, fruit, and yogurt cultures and contain no artificial preservatives, artificial flavors, or colors from artificial sources. The brand's mainstay Yoplait Original is now made with reduced fat milk although when the brand first arrived in the States, it was made with whole milk. Compared to the brand's regular yogurt, the new French-style yogurt is thicker (and richer due to the whole milk). The new yogurt line differs from a lot of current yogurt offerings in that each serving is both cultured and sold in a glass "pot" rather than a plastic cone, cup, or tub (compared to being made and then poured into a container). The glass cup and the handwritten-like font of each flavor gives somewhat of an artisanal or home-made feel to the packaging. Oui by Yoplait comes in eight flavors at launch, including Strawberry, Blueberry, Black Cherry, Vanilla, Coconut, Lemon, Peach and Plain. Plain is made with just two ingredients--whole milk and yogurt cultures. The fruit flavors, like some yogurt products currently on the market, include fruit at the bottom. You can find the new yogurt at major retailers starting this month. The suggested price is $1.49 per 5-oz container. Strawberry and Vanilla flavors are also available in four-count packages carrying a suggested price of $4.78.